• The Endeavour wasn't the vessel's first name - launched in the northern English town of Whitby in 1764 as a collier, she was originally called the Earl of Pembroke and didn't have her named changed to HMS Endeavour (sometimes also called the HM Bark - HMB - Endeavour) until she was purchased by the Royal Navy in 1768 for a scientific mission in the Pacific Ocean. • Lieutenant James Cook, who was to command the mission, chose the Endeavour for its sturdiness and practical useability; it was a solidly built and also had a shallow draught, minimising the chance of running aground when travelling in uncharted waters. It was adapted for its new use at the Deptford Royal Dockyard in England. • With Cook in command, the ship departed Plymouth on England's south coast in August 1768 on a two part mission - firstly, an overt mission to observe the transit of Venus across the Sun from Tahiti and, secondly, a secret mission to explore the southern seas for the supposed 'Great South Land'. • In October, 1769, the Endeavour arrived in New Zealand - the first European ship to do so since Abel Tasman's Heemskerck in 1642. It remained in New Zealand for six months as Cook mapped the coastline and concluded it consisted of two great islands and was not the hoped for 'Great South Land'. • In April, 1770, the Endeavour become the first acknowledged European ship to reach the east coast of Australia - during the trip Cook landed at Botany Bay in what is now Sydney where he 'claimed' the land for King George III, and ran aground on the Great Barrier Reef off the coast of what is now Queensland, only saving the ship by throwing her ballast, decayed stores and some of her guns overboard (six cannons were located in 1969 and some are now located at various sites around the world including at Botany Bay). • The Endeavour actually underwent several name changes. Following her epic voyage to Australia, the Endeavour spent much of the early 1770s then sailing between the Falkland Islands and Britain for the Navy before, in 1775, she was sold into private hands and later renamed the Lord Sandwich. • Her final moments came in 1778 - having been earlier hired as a British troop transport and prison in the American War of Independence, she was eventually scuttled in a blockade of Narrangansett Bay in Rhode Island along with 12 other ships to prevent a French attack. She lays there still but it's been estimated that only up to 15 per cent of the timber hull now remains. • Efforts to recover the ship's remains are being led by the Rhode Island Marine Archaeology Project. It is understood that, thanks to a court process under which the US state of Rhode Island "arrested" shipwrecks in Newport Harbour, the ship's remains are now in the ownership of the state. 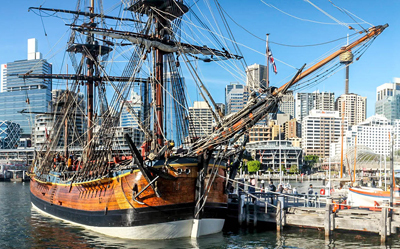 • A replica of the Endeavour was launched in Australia in 1993 after a five year building program and, when not visiting other cities, calls the Australian National Maritime Museum in Sydney's Darling Harbour home. The ship has sailed more than 170,000 nautical miles, twice around the world, and visited 29 countries. The name has also been carried on in the Young Endeavour which operates as a training ship for youth. • The now retired US Space Shuttle Endeavour was named after the ship.